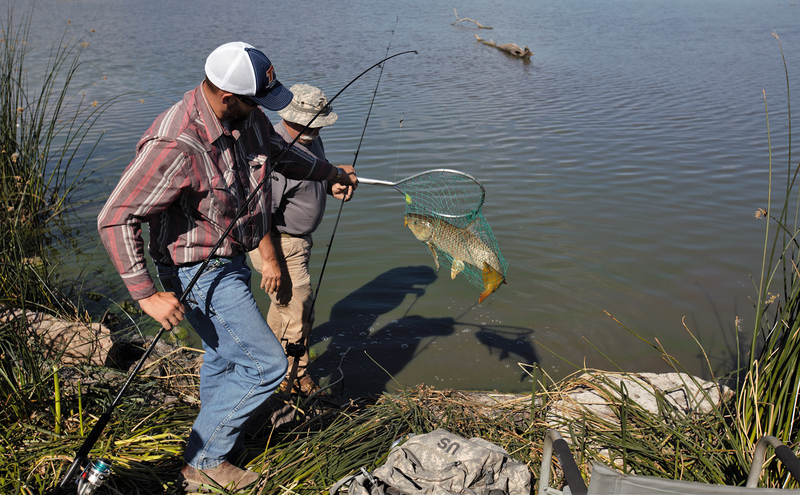 On Saturday, August 18, FOMR and Refuge staff will host the annual Carp Fishing Derby at Malheur Headquarters. This event, which began in 2010 and has been held nearly every year since, has traditionally served to kick off a week-long carp fishing season at the Refuge. Today, it’s an opportunity for visitors to come to the Refuge and participate in a good-natured fishing competition, as well as learn more about common carp and the management issues they pose to Refuge staff. Common carp were introduced to Harney Basin waterways sometime in the early 1900s, likely as a source of food for landowners. They began showing up at the Refuge in the 1920s, and by the 1950s their expanded numbers were having detrimental effects on aquatic habitats within the Refuge. Common carp are bottom feeders, and their constant rooting about for food clouds the water and smothers aquatic vegetation, depriving it of the sunlight necessary for photosynthesis. As aquatic and emergent vegetation disappeared from Malheur’s waterways during the height of the carp invasion, waterfowl and shorebirds—dependent on these habitat types for feeding and nesting—abandoned the refuge. Carp management is therefore a top priority at Malheur Refuge. Past management efforts have involved piscicides, explosives, electroshocking, fish barriers and removal by hand. Each of these methods has upsides and downsides; all have met with lukewarm results thus far. Currently, the Refuge works with commercial fishing fleets to net the carp en masse and convert them to organic fertilizer. Events like the Carp Fishing Derby at the Refuge put a light-hearted spin on this serious conservation issue. The Carp Derby is designed primarily for kids, but everyone is welcome to participate. There will be games and activities, educational information about the effects of carp on Harney Basin wetlands, plus prizes for the best fishing and some cooking of carp to feed the attendees. Directions: From Burns, Oregon, go south on Hwy 205 to Sodhouse Lane (first left turn after you cross the bridge at the Narrows) and follow the signs to Refuge Headquarters. Will I need an out of state fishing license to fish for carp? They aren’t exactly a game fish. Hi Dennis, you do need a valid Oregon fishing license for carp.